With over twenty years of experience in the real estate business, in one capacity or another, I have been staging homes before it even became a standard practice. With acquired skills through design experience and formalized training, I can make your home “Market Ready”. 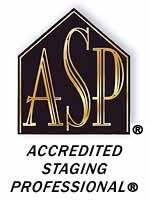 As an ASP (Accredited Staging Professional) I have a proven track record for staging homes for faster sale time and higher sales prices.. It is a proven fact; staged homes sell faster and higher. Statistically, 95.6% of staged homes sell, on average, in 37 days or less.